Location/Climate: On south coast of Seward Peninsula, 510 air miles west-northwest of Anchorage.18"/yr. precip., -3°F65°F. Population: 3,984 (52.1 percent native, mainly Eskimo). Travel Attractions: Seward Peninsula, Bering Land Bridge National Park, Iditarod race finish and history, mining history, museum. Getting There: Scheduled air service from Fairbanks, Anchorage, and other points. Information: Nome Convention and Visitors Bureau, P.O. 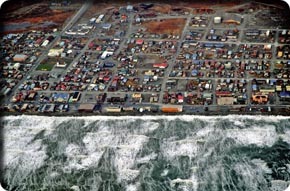 Box 251, Nome, AK 99762, 443-5535, www.nomealaska.org. "Theres no place like Nome!" shouts the citys mottoand its true. When gold was found in the sands near the mouth of Anvil Creek east of town in 1898, yet another of Alaskas gold rushes was on. By the turn of the century, 20,000 miners were working the beaches of Norton Sound and upstream placer depositsone-third of Alaskas non-native population at the time. By 1905 the rush faded and the population stabilized at around 5,000, where it remains to this day. Gold history litters the region, including the ghost town of Solomon, the abandoned locomotives of "the train to nowhere," and several rusting dredges. In the winter of 1925, Nome was struck by a diphtheria epidemic, necessitating that medical supplies be brought overland from Nenana. Mushers and their dogs made the 674-mile trip in about 128 hours, inspiring the creation of the Iditarod Sled Dog Race. The race follows much of the historic Iditarod route that brought miners to the region from Seward during the gold rush. Nome is thrust onto the world stage for two weeks every March as the racers follow the modern route from Anchorage. Related events include the Bering Sea Ice Golf Classic (March), in which competitors hit orange balls toward dyed "greens" on the frozen Bering Sea. On Memorial Day you can join the crazies who think 35°F is about right for a dip at the annual Polar Bear Swim. From Nome, you should be able to access Bering Land Bridge National Preserve by air. Regular flights go to Kotzebue, Saint Lawrence Island, several native villages, and to Nomes sister city of Provideniya, Russiaone hour away by air. Nome is a good town for walking, exploring, and meeting peopleand its as Alaskan as you can get! Carrie M. McLain Memorial MuseumLocated in the basement of the library, the collection includes natural history, native and gold-rush artifacts, and gold-rush-era photographs. Kegoayah Kozga Library, Front Street, 443-2566. Open MondaySaturday 1 p.m. to 7 p.m. (closes at 6 p.m. Saturday), call to confirm hours; free. Dogsled ridesThe dogs need something to do in the summer. Inquire at the Visitor Information Center or call the Burmeisters at 443-2958. Visitor Information CenterScrapbooks, photo albums, and historic displays flesh out this source for information on Nome and its environs. Front Street at Division, 443-5535. Fat Freddies, Front Street east of Bering Street, 443-5899, is right on the water. Its connected by a long hallway to the Nugget Inn, which is nice when the weather is rough. Tasty seafood offerings. Golden Sands Guest House, 411 Alley Way, 443-3900. The $55 single and $65 double rooms include a continental breakfast. "Sleeping-bag space" is available for $25. 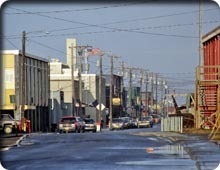 No Place Like Nome Bed-N-Breakfast, Steadman Street and E. 5th Street, 443-2451, singles $60, doubles $70. A full sourdough-pancake breakfast is included. Nugget Inn, Front Street and Bering Street, 443-2323. This Nome classic offers ocean-view rooms in the heart of town. Its clean and has character, with an entertaining lobby and a waterfront lounge. Rooms $85$95. Pizza Napoli, Front Street at Lanes Way, 443-5300. Decent pizza and other goodies at a fair price. Polar Cub Cafe, Front Street and Federal Way, 443-5191. This local favorite has the best breakfast in town. Ponderosa Inn, Spokane Avenue and E. 3rd Street, 443-2368. Enjoy a homey feel. Singles, doubles, and full-kitchen suites $64$120. Twin Dragon, Front Street between Lanes and Federal, 443-5552. Nomes center of international cuisine. Plan on renting a vehicle in Nome. More than 280 miles of maintained roads branch out from town, enabling access to mountains, hot springs, gold sites, wildlife viewing, and native settlements. If you travel with a partner or two and take advantage of free camping, the cost of rental can be reasonable. Pick-ups can be rented at Stampede Rent-A-Car (443-3838) or Alaska Cab Garage (443-2939). Rates are about $80 a day, gas goes for around $2 per gallon. Sites worth visiting along the three main highways are described below. Allow at least five hours for a round-trip on any of these good gravel routes. Nome-Teller Highway (Teller Road/72 miles)Heading northwest from town, the route crosses through rolling tundra and grasslands and passes through the western end of the Kigluaik Mountains. The road ends at the native village of Teller (population 274, 87 percent Eskimo), once a gold-boom town of 5,000 but now oriented toward commercial fishing and subsistence wildlife harvesting. A herd of more than 1,000 reindeer grazes in the area; some of the herd is harvested by the residents. Look for signs of some local disaffection with the federal government. Stop in at the store for a chat. About halfway from Nome to Teller, Wooley Lagoon Road cuts a short way south to the beach, homes, fish camps, and wetlands of Cape Wooley. Nome-Taylor Highway (Kougarok Road/89 miles)This route provides access to the splendid Kigluaik Mountainsan under-appreciated feature of the peninsula. A campground is located at Salmon Lake (Mile 38), not far from the pass through the range. About 65 miles out from Nome, a road branches to the west for about 8 miles to Pilgrim Hot Springs. Inquire at the visitor center about the status of the springs, which are on church-owned land. Beyond the Kougarok Bridge at Mile 89, the road ends, becoming an ATV trail and a winter road to Taylor. Inquire about conditions. Nome-Council Highway (Council Road/73 miles)From Nome, the Council Road heads east along coastal flats and bars, and then continues inland at Dickson and on to Council, a traditional seasonal camp for the Fish River Eskimos. At Mile 36, youll come to the ghost town of Solomon where many remaining structures hint at the towns thriving gold-rush past. Just beyond Solomon, to the right of the road, you cant miss the three wonderfully rusted, turn-of-the-century locomotives from the long-defunct Council City and Solomon Railroad. During the gold rush, Council was home to as many as 15,000 people; today there are a number of vacation homes and only about eight permanent residents. Dont try to drive across the stream at roads end into Council unless youve scouted the current ford carefully or can follow a local.